We were going to hold off on painting the topsides for a while, but I decided I wanted to go ahead and get it done because the decks were matte gray which made them VERY hot midday! We knew the new shiny white would help reflect a lot of that heat. I ended up doing 2 coats of paint and sprinkling the skidless compound onto the first coat while it was wet. The second coat then sealed everything up and made it a little less rough feeling. We choose to use the skidless compound purely because it was the cheapest option. It didn't turn out too bad, but is rougher and less evenly distributed than I would have hoped. We would have loved to use Kiwigrip or something if we had the money...maybe next time it needs redone! All in all, it sure looks way better and isn't hot at all now! Oh and I used a lot of paint thinner to remove all the paint from my feet because I kept stepping in it (after repeatedly warning Matt to be sure and not touch anything)! I have a question about the easypoxy paint. Does it not require a sealer? My boat's deck is in need of a new coat of paint and I'm trying to find the best option that's easy on the wallet. Nope! No sealer required! It is so easy to use, just stir it and roll it on. It will make such a huge difference! How long did it take to dry and did you wait in between coats? It was pretty quick to dry because it was so hot and humid out. I did wait 24 hours between coats just to be sure though! Hello! Love your blog and all your DIY posts especially. We're about to paint our deck with this same stuff. After you applied the first coat and then the non-skid, did you sand before applying the second coat? If so, was that weird with the non-skid compound on there? Thanks! Hi Ryan, thank you! We didn't sand between coats, just waited 24 hours and recoated. The sand ended up being really rough so I put quite a few coats of just the paint on top of it so it wasn't as sharp feeling. I'd really like to redo it with Kiwi Grip when we have a bit of extra time and money though! Great. Great blog! So, you did sand prior to the first coat? What type of sand paper? BTW, I'm going to give a try with the memory foam mattress. 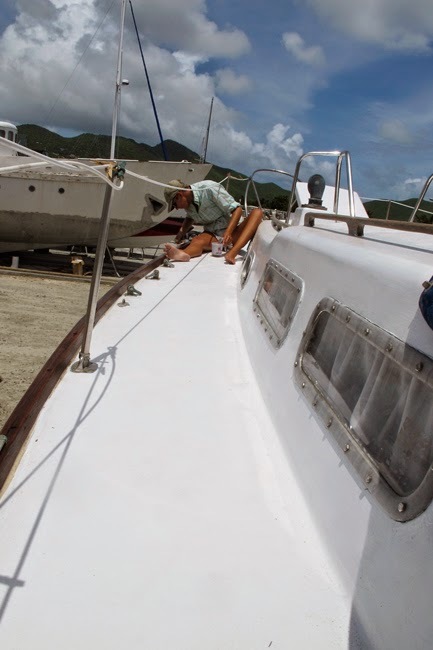 Thanks, your blog gives me hopes with our new old old sailboat.